Born in Lagos (Nigeria), and raised in St. Paul (Minnesota), Sam Adegoke is a Nigerian-American actor who currently stars in CW’s hit show Dynasty as Jeff Colby. His big break came when he was chosen from thousands of submissions as the 2015 winner of the ABC Discovers National Talent Competition. Since then, Sam has played roles on many shows like Code Black, NCIS Los Angeles, Switched at Birth or Murder In The First. In our latest exclusive interview, we’ve been able to sit down with Sam and talk with him about his experiences and thoughts about Dynasty. The show will be back on March 9th in the United States, airing on it’s new night (Fridays). Check out the interview in Spanish by clicking on this link. – After working on shows like Switched at Birth (Freeform) or Murder in The First (TNT) this is your first big main role on television. What can you tell us about your experience so far on Dynasty? It’s been an amazing and enjoyable experience and I’m having a blast with this character. I think my biggest takeaway with the difference between guest star/recurring and being a series regular is patience. When you guest star or recur on a show, you usually jump into the story guns blazing and immediately throw a stake in the ground that the series regulars have to resolve by the end of the episode or within the few episodes. Series regular is certainly more of a long game. Not to say you can and shouldn’t make strong choices, but as a reg, your character’s arc and their motives or agendas have more time to play out and may not be immediately obvious, particularly with my character Jeff Colby. For the first eight episodes, he was a mystery. He seemed like just a nice rich guy who loved Fallon Carrington (Elizabeth Gillies) and little else was known about his true intentions. Viewers may not know this, but we usually don’t know what will happen with our characters until we get the script for the episode we’re shooting. So in the beginning I had no idea Jeff would be where he’s at now. I kept wanting more for him, like give Jeff a meatier story line. Boy did I get it! (laughs). I love what our writers are doing with this guy and his big revenge scheme against the Carringtons, and I can’t wait to see where it goes. – As an actor, do you feel like you have an extra responsibility since you’re playing a role in the adaptation of such a classic? I certainly did initially. With a franchise as big as Dynasty was, you cannot but feel added responsibility to make it work. It was such a massively popular with iconic characters and great actors that ruled TV for a decade. And it had a DIE-HARD fan base. Like literally the soap opera version “Wire” or “Game of Thrones” in its time in terms of influence and popularity. With the CW reboot having a more diverse cast and the fact that I get to reimagine an iconic character as a black man made me realize what a tremendous and unique opportunity I had to make this character my own. I certainly have a profound respect for the original, we wouldn’t be here without it, but now I’m less concerned with pressures from the original and more excited at the privilege to put my stamp on this character and show in my own way. The CW has let me do just that. I even got to bring my culture to the show when I requested to make the Colby family Nigerian. Our showrunner and producers signed off on the idea, and now I’m getting to speak my native tongue of the Yoruba tribe of Nigeria on the show, opposite Hakim Kae Kazeem who plays my father, Cecil Colby, who is also of the Yoruba tribe. As far as I know Nigerian culture has never been highlighted this way on a major broadcast network. We’re making history and I get to be a part of that. It’s beyond amazing. – Do you think that fans of the original series can jump in and enjoy this modern adaption? I believe so, if they come with an open mind. We’re paying homage to the original but we are really making this our own story line, with a new cast, a new city and new agendas. With so much diversity that’s more reflective of the differences in our world today, I truly believe there’s something for everyone in this version of Dynasty. We cross so many ethnicities, ages, generations and schools of thought, and we’re touching on topics of immigration, race, gender equity, social caste systems with textured characters that are neither good nor bad, but just flawed people. I hope that resonates and I hope they give us a chance! 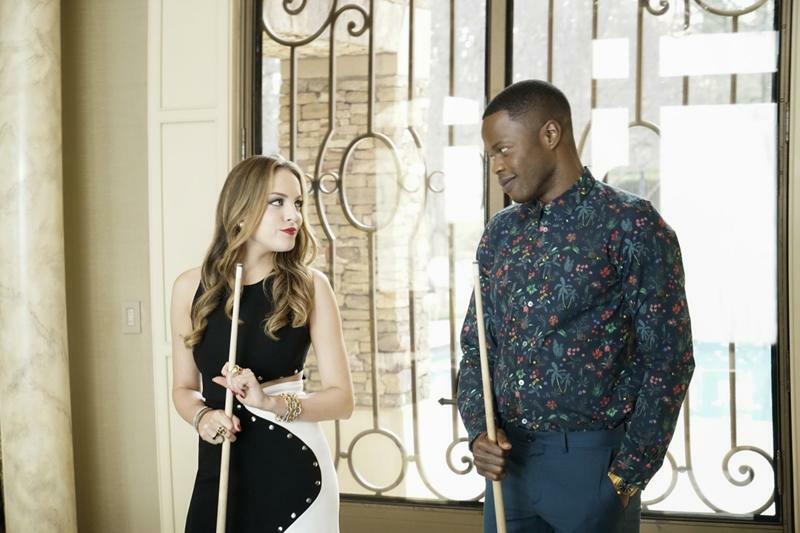 Elizabeth Gillies and Sam Adegoke (Dynasty, CW). – Tell us about your character Jeff Colby. Moving on, how does he fit in the show’s story? Jeff Colby is certainly one of the more complex characters I’ve played, and a challenge is always attractive. He’s a whip smart, self-made tech billionaire with a high moral compass who believes in doing what is right and will sacrifice anything and go to any length to protect his family. At the same time he can’t let go of past wrongs done against his family and his lust for power and revenge could be his very undoing. He can be charming or curt, patient or quick tempered, and visionary or short sighted all at the same time and that constant dichotomy and all those layers and textures make for a very fun character to play. Jeff is and will likely continue to be a rival of Blake Carrington. We’ve recently lear vbbned that Jeff wants to marry Fallon Carrington as part of his master plan to take over Carrington Atlantic and get his revenge against Blake Carrington for falsely putting Jeff’s father in jail. Grant Show and I often talk about our stories and despite being enemies, the similarities between Jeff and Blake. In many ways Blake is like a surrogate father to Jeff and Jeff is the son Blake never had. It’ll be interesting to see those dynamics continue to play out between these two stubborn men who at one time were friends. – Dynasty is quite a crazy show full of twists and big moves. What have you learned from its world? Never guess. I mean it’s fun to try and decipher what’s going to happen and sometimes you’re right but more often than not. Our showrunner Sallie Patrick and our amazing crew of writers love to take you on a ride. Before we shoot each episode, we table the new scripts, and every time everyone leaves the consensus is : “Sure as hell didn’t see that coming.” It makes it fun. I love the anticipation of waiting for a new script to find out what happens next. – Besides Jeff, do you have a favorite Dynasty character? I really like Alan Dale’s character of Anders. He has the best lines and Alan’s dry New Zealander whit delivers them like they were his very own. I know what he’s going to say and it still cracks me up when he does. I also love what Rafael De La Fuente is doing with Sammy Jo. Scenes with Anders and Sammy are always a treat. – For people that haven’t checked in yet, why should they give Dynasty a chance? It’s a drama, its soapy, and it’s about rich, decadent people with fly cars, fly clothes, and stupid amounts of money. But when you strip all that away I think people will be surprised to find it’s really about flawed people who will go to any length to fight for and protect their loved ones and what they believe is right. Those are elements anyone can relate to. I also hope the inclusive casting choices that are more reflective of our world today is a draw for people. We really span so many differences and there’s something and someone that everyone can identify, relate to and root for. An interview by Chris Patterson and Elena Rodriguez. Main photo credit : Vince Trupsin.